Linda LaRue Blog: The April digital e-Issue of Make Healthy A Lifestyle is here! The April digital e-Issue of Make Healthy A Lifestyle is here! April is an early spring transition month that can frustrate and foul all your weight loss and workout intentions and goals. Seasonally our bodies are intuitively yearning to get outside and move again. However, the weather oftentimes brings April showers or maybe one last big snow storm to foul our best laid intentions for a walk, hike, or jog. One minute it's beautiful and sunny—the next dark storm clouds and rain. That’s why this in this month’s issue of Make Healthy we’ve designed Part 2 of MH Lifestyle’s How to Create Your Best Ever Home Workout with indoor and outdoor workout options. 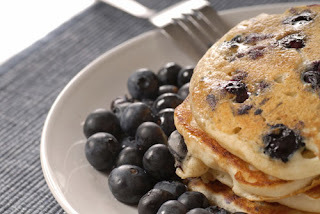 Plus, we’ve given you a great breakfast recipe, my high protein blueberry pancakes, from The SOUPer Slim Diet to start your day out right, and an article about a very important muscle, Confidence, by my friend Maura Barclay. Confidence is the new, hot commodity to have today. Check out our new, Weight Loss, Nutrition, and Fitness Applications column featuring Lose It!. I’ve been using this free app for the past couple weeks, and plugging in my food and workouts every day. (It’s always an eye opener to actually record what you put in your mouth. Yikes! Did I really eat that many cookies throughout the day?!?) I like the fact that with a only a couple quick strokes I can input all my food and workout data then, get immediate Caloric and weight loss feedback. As part of our “How To” plan to help you achieve optimum health and your best body ever, we’ve added a male perspective by well known NYC Fitness and Wellness expert Celebrity A-Lister and owner of The Madison Square Club Workout and Wellness Center David Kirsch. Many of you guys have emailed about getting a guy onboard to give their wellness, training, weight loss, and nutrition views. David is one of the best-selling mind-body wellness book and workout DVD experts in the industry today. We are honored that he is reaching out and contributing. I love David’s line in his article about riding thru the streets on his bike in Manhattan early in the morning alone. It paints such a simple, bold picture. Hibernation time is over. Although summer (and bathing suit) season is only weeks away, you still have plenty of time to lose a couple dress or bathing suit sizes and get in shape if you commit and start now. Our Best Ever Workout Plan along with Lose It’s! free and easy accountably app will keep you on track, and will help you steadily achieve your goals. If you feel that you need a little 1:1 attention, plz contact me at info@LindaLaRue.com for some personal training.